Divisional Budget Templates for Excel provide an efficient way to establish divisional monthly budgets and reports to calculate differences and variances starting at any 12 month period. The start date/year to any month end date can be specified. The currency can be set to any symbol by opening the Format menu in Excel and selecting Cells from the drop down list, which produces the Format Cells table. Clicking Currency enables the choosing of the currency to work with from the Symbol panel. Divisional Budget Templates for Excel overhead budget can be created and fixed costs allocated to individual divisions. Revenues and expenses can be budgeted by individual categories within individual divisions. There are 30 revenue categories and 100 possible expense categories for each division and each one can be described just as desired. The cost of sales can be varied for each revenue subtotal within each separate division for highly accurate budgeting. 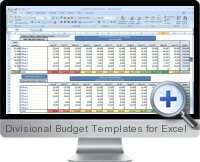 Divisional Budget Templates for Excel actual revenue and expenses can be input for each division on a monthly basis. Monthly divisional reports are calculated, providing differences, variances and summary totals. The reporting month end can be changed to review past results, differences and variances by division. The consolidated divisional budget report combines all divisional budgets and actual data into a year to date summary with consolidated differences and variances for each revenue row and expense category. The Divisional Budget Templates for Excel also includes benchmarks for individual business sectors.